Large Office Sound System Package | Pro Audio Superstore Denon DN-300ZB CD/media player for AM/FM, CD, MP3/AAC/WAV, or Bluetooth streaming audio. Perfect for the DIY owner. The heart & brains of the whole system is the JBL CSMA180 70V mixer amplifier. 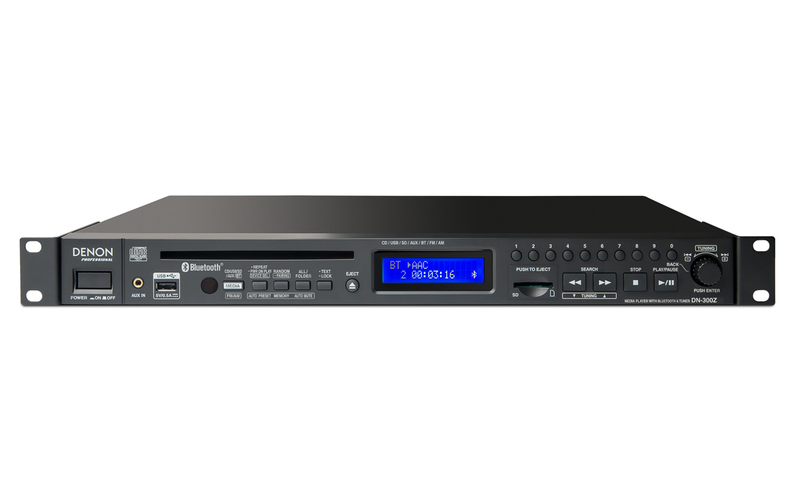 The CSMA180 allows you to connect up to 4 different sources like CD players, satellite receivers, and MP3 players. 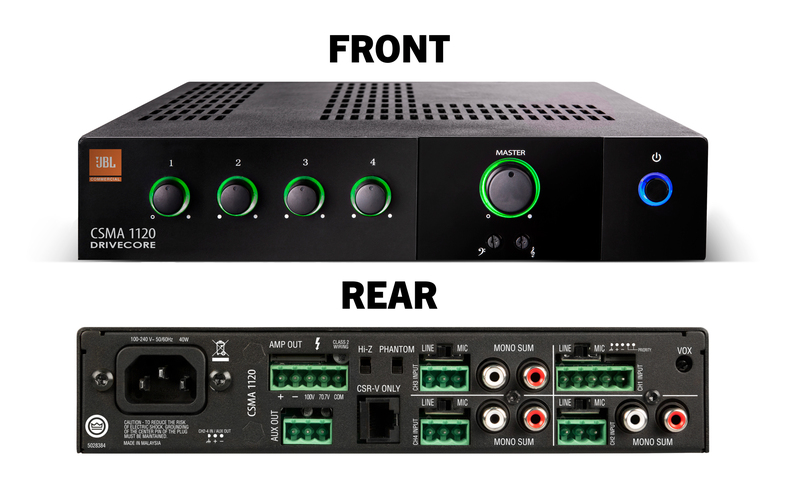 Those inputs are mixed down to a single 70V speaker output with 80W of power. The CSMA180 even has a microphone input with voice priority so you can set it up as paging system that will duck out the music for any pages that come through. The CSMA180's highly efficient Class-D DriveCore amplifier makes these units environmentally friendly as they draw less power and due to their reduced size and weight, are cheaper to ship. The CSMA mixer/amps offer unmatched ease of use, with a clean, front panel featuring only volume controls for each channel, master volume adjustment, adjustable bass and treble controls and a power switch. All the volume controls are surrounded by an illuminated ring, making them easy to see and operate in darkened environments. The amplifier can drive 8 ohm and 4 ohm loads and can be used with 70V and 100V distributed audio systems without the need for a separate transformer. In addition to balanced mic/line inputs, unbalanced RCA inputs and speaker connections, all units include RJ45 connectors for use with JBL CSR-V in-wall volume controls. All models feature a universal power supply which enables the ability to accept AC voltages from 100 to 240 VAC, 50/60Hz. JBL Commercial mixer/amps are manufactured under HARMAN’s GreenEdge™ environmental initiative, conforming to lead-free RoHS standards and utilizing recycled copper, aluminum and steel, an energy-saving powder coat finishing process and other environmentally-conscious manufacturing processes. Their highly efficient DriveCore design reduces power consumption and yields much more efficient operation – up to 80 percent more efficient than previous designs. All models carry a 3-year no-fault transferable warranty. Control 14C/T is a full-range ceiling speaker consisting of a 100 mm (4 inch) high tech cone driver and a 19 mm soft-dome liquid cooled tweeter mounted in a vented, paintable baffle made of UV resistant UL94-V0 and UL94-5HB material, with a pre-attached blind-mount backcan for quick and easy installation. The JBL Control 14C/T is our most popular in-ceiling speaker. 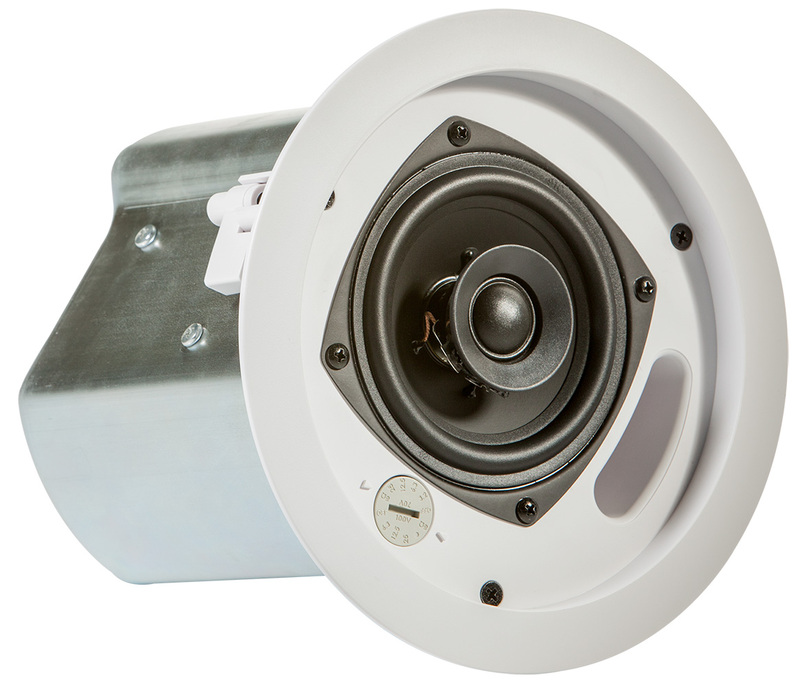 We sell literally thousands of these speakers every year because they sound fantastic, they are well built, and they include all of the required mounting hardware for both drywall and drop-tile ceilings. The Control 14C/T is designed for use with 70V systems. It is a coaxial speaker with a 4" low frequency driver and a 0.75" soft-dome liquid-cooled tweeter. The speaker is completely housed and sealed in a metal can. It features a removable phenix terminal block for the speaker input and output. The grille is removable with a dial underneath for selecting the wattage tap for the speaker. It has taps at 3.2W, 6.3W, 12.5W, 25W, or an 8Ω Bypass as well. Also, you can rest easy knowing that these speakers are up to building code standards with it's UL2043 Plenum listing. Combining the best of disc, wireless, and solid-state media playback, the Denon Professional DN-300ZB is an all-in-one audio player you can count on when the whole room is listening. Ideal for front-of-house, education, music and rehearsal studios, houses of worship, restaurants and more, it has an answer to every request—all consolidated into a compact 1RU design. Extending Denon Professional’s dedication to powerful solutions that are easy-to-use, the DN-300ZB plays the media of both today and tomorrow, in formats easily accessible to any user. It really does expect the unexpected. Go ahead, throw anything you want at it: Front-loading media slots (CD, USB, SD/SDHC) deliver intuitive playback of today’s familiar mass-storage mediums. Or, go wireless with long-range Bluetooth audio connectivity (up to 100 feet) and instant recall of up to 8 devices such as smartphones and tablets. With support for CD-DA, MP3, WAV, and AAC file formats, the DN-300ZB is the master-of-all-trades player that excels when the unpredictable occurs. The front panel’s backlit LCD screen provides at-a-glance status of playback modes and content, providing clear readouts to even the most novice user. Designed to adapt to any scenario, switching formats on the fly has never been easier. Media categories and their respective controls are grouped together so users will never have to wrestle with deep menus or use the instruction manual to perform basic functions. Direct access to CD tracks, global transport controls (play/pause/search), and a rotary-push encoder translate to fast, hands-on command when you need to get to your content. An IEC-weighted AC power port means space-saving connection to power sources—no bulky transformers or “wall warts” required. When installed into a client’s rack, the DN-300ZB provides the capability, reliability, and versatility to tackle any playback task, from one-off requests to rehearsed program material, in an intuitive, tidy package.